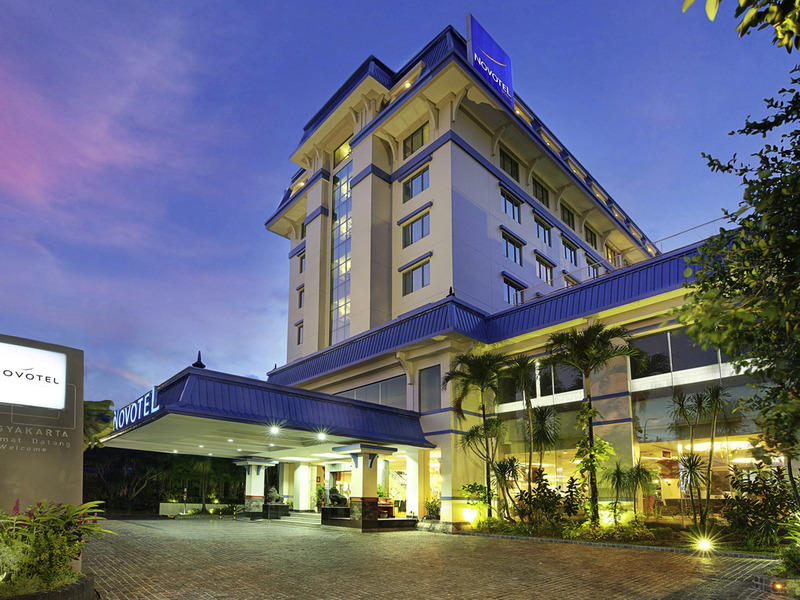 Strategically located in the city center & surrounded by UNESCO World Heritage sites, Novotel Yogyakarta would be the best choice for your business & leisure trips, on your own or with your family. I look forward to welcoming you to Novotel. Strategically located in Yogyakarta, the hotel features spacious and cozy rooms. Unwind at the outdoor tropical pool, entertain your palate in our Italian restaurant, get fit in our fitness center, relax in our sauna. Free high-speed WiFi is available throughout the hotel. The 9 meeting rooms and the ballroom are ideal to host your meetings, events and weddings. As a family or solo, on vacation or for work, Novotel Yogyakarta's team, known for their attention to detail, is expecting you! Located in the heart of city, Novotel Yogyakarta is just 15 minutes drive to Adisutjipto Airport and 10 minutes from Tugu Train Station. The hotel is just 10 minutes drive from the famous shopping area of Malioboro and the Sultan Palace. universities, government and business districts can be reach in 5 minutes. Borobudur & Prambanan temples, part of the UNESCO World heritage sites, are one hour drive from the hotel. Hotel can arrange your transportation to many tourist attractions. Explore the UNESCO World heritage sites with Borobudur & Prambanan temples, discover white sand beaches & Merapi mountain, dive into culture at the Sultan Palace, shop batik souvenirs at Malioboro street and taste the Yogyakarta's culinary flavours. Located at city center of Yogyakarta, surrounding by offices, hospital, and shopping center. Have 9 meeting rooms to support your conference needs. Find a perfect mix of traditional and international cuisine in this romantic restaurant, which features a magnificent aquarium and tantalizing cuisine for breakfast, lunch and dinner. Located at the poolside, this place is really a good place for hanging out and refreshes yourself while fresh enjoying our delicious crispy pizza and pasta, pure Italian style. All staffs gave my family and I very good services. We could enjoy an upgraded room by showing the “upgrade voucher”. The breakfast was really delicious too. Thank you Novotel Jogjakarta. But I was wondering, on my last night of my stay, when I came back to my room, there's a cigarette smell on my bathroom. I stayed alone, and didn't smoke either. This time I have stayed for 6 nights from Saturday 6th April to Friday 12th April 2019. As usual as the Accor Gold Member we have special attention from the hotel staff and crew. Everybody always smile and serve us with their best that they can do. We do really appreciate this service which makes us feel like stay at own home. Since the hotel location is in the heart of Jogjakarta city therefore we can reach any interesting destination in Jogja area with easy ride or easy walk. I'm not totally satisfied because my LE CLUB ACCOR Hotels membership card was not recognised. the reason given was we booked through a travel Agent. I was disappointed since elsewhere (Novotel) my card was accepted and I had earned points for my stay. I will not be using my card anymore I think. Novotel location is close to shopping mall, all the staffs are friendly. Breakfast menu good maybe need improvement on the pastry section. The pastriess taste dry not moist when you taste it. The tea in the jug too light. I need to put another tea bag into my teacup so that I can taste the tea. Maybe need to train staffs how to make good cappuccino because the staffs seems intend to put too much milk or a creamer. The room nice but I think the AC not really cold need Improvement. Other than those things..I did enjoyed my stay at Novotel Jogja. Surely will come back to stay at Novotel Jogja. Warm greeting, best food, and nice room. Clean room, nice staff as usual. I have been stayed in Novotel Yogyakarta for several times. With my family or alone.